I had a few ideas floating through my head for The Daily WordPress Photo Challenge for this week – Contrast. But this afternoon, when I was helping my son fix a giant Lego battleship that my other son had ruined earlier in the week, I found his white Ninjago Lego guy and a light in my head went on. 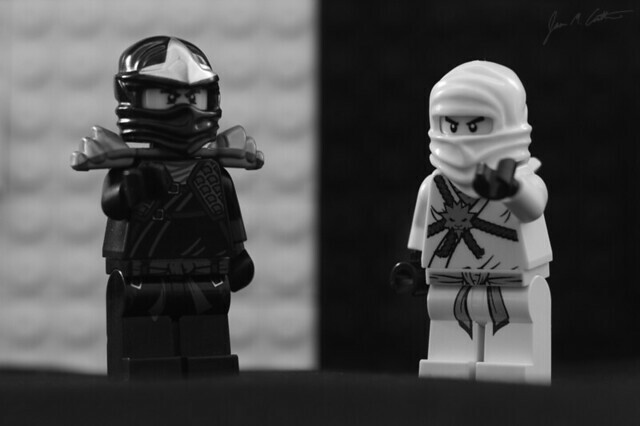 Rather than doing a Yin and Yang for contrast, I did a Cole and Zane photo (if you don’t get that reference, ask your Lego enthusiast). I used white and black Lego’s to make a backdrop (which was not easy feet, because my son had used almost all of his Legos for a large battleship). I thought the blurry nubs in the background would provide an interesting, and appropriate backdrop for the Legos. I was interested to see the black nubs didn’t show up as well as the white, but again, it worked for a nice contrast. I took a few photos, and when I felt I had it right, I shot in RAW format so that I could adjust the white balance afterward. But since I changed it to Black & White, I guess shooting in RAW and adjusting white balance doesn’t really make a difference. Oh well.